Now you can easily Install TWRP Recovery and Root Essential Phone. If you are an Essential Phone user and looking for a rooting guide then you are in the right place. Here we share how to Install TWRP Recovery and Root Essential Phone. First, you need to install TWRP Recovery on Essential Phone and then flash Magisk to Root Essential Phone. Recently, TWRP recovery got updated with material designed to TWRP 3.1.0. That means you can install the latest TWRP 3.1.0 on Essential Phone. Follow this guide to Install TWRP Recovery and Root Essential Phone. 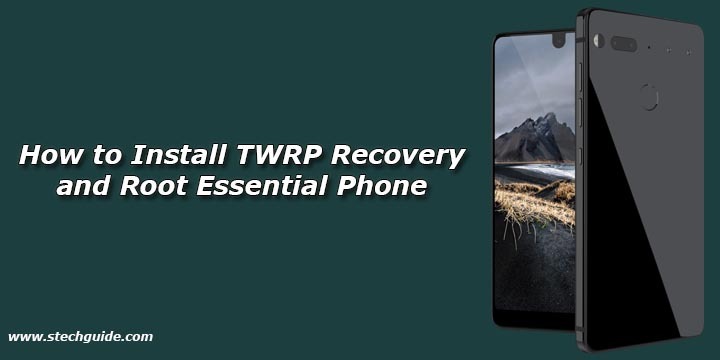 If you are an Essential Phone user, then you can Root and Install TWRP Recovery on Essential Phone. Thanks to the XDA Senior Member bmg1001 who share the unofficial TWRP for Essential Phone. So here is the step by step guide to Root and Install TWRP Recovery on Essential Phone. Read the below note carefully before you Install TWRP Recovery and Root Essential Phone. 1) First enable USB debugging and OEM Unlock by setting>developer option>. To enable Developer Options, go to About phone and tap the Build Number 7 times. 5) Type the below command correctly in command prompt and then press Enter. 9) If you’re running on the NMJ32F build and are using the latest TWRP build (twrp-mata_6_NMJ32F) then skip step 10. 11) Now reboot! Your Essential Phone root successfully via Magisk! So this is the complete guide on how to Install TWRP Recovery and Root Essential Phone with easy steps. If you have any questions, then comment below. After following these steps I did not have root access. I then did step 10 and found that I do have root access but my WiFi will no longer activate.